Founded in 1955 as the American Family Life Assurance Company of Columbus, Aflac (AFL) provides voluntary supplemental health and life insurance products to about 53 million global customers. The insurer operates through two segments, Aflac Japan and Aflac U.S.
Aflac Japan (70% of sales, 72% of profits): offers voluntary supplemental insurance products, including cancer plans, general medical indemnity plans, medical/sickness riders, care plans, living benefit life plans, ordinary life insurance plans, and annuities in Japan. Aflac U.S. (30% of sales, 28% of profits): provides products designed to protect individuals from depletion of assets comprising accident, cancer, critical illness/care, hospital indemnity, fixed-benefit dental, and vision care plans; and loss-of-income products, such as life and short-term disability plans. The company sells its products through sales associates and brokers, independent corporate agencies, individual agencies, and affiliated corporate agencies. Like all insurance companies, Aflac makes money two ways. First, the company attempts to price its insurance products in a way as to manage risk and turn a profit on its policies. If the total premiums Aflac receives over time exceed the firm's total payouts, the firm generates an underwriting profit. The key metric to watch is the combined ratio, which is the ratio of total policy costs (payouts) over the premiums received. A combined ratio below 100% indicates that the insurer made an underwriting profit during that period. Aflac has a great track record of highly disciplined underwriting, meaning that it consistently turns a very high profit on its policies, both in Japan and the U.S. For more than a decade, Aflac’s annual cash flow from policy premiums has exceeded the policy benefits the company has paid out. In other words, Aflac’s actuaries have done an excellent job assessing and pricing risk accordingly. This keeps Aflac’s costs very competitive and frees up more funds to be invested for additional income (more on that in a moment). This can be seen in the Aflac’s long history of relatively low combined ratios, which represents the profitability of its insurance policies. As you can see, Aflac’s combined ratio has been steady around 80% over time, indicating that it generates around a 20% operating profit margin on its policies, which management thinks is sustainable in the long term. The other way Aflac makes money is investing what's called insurance float. Float is the money an insurance company holds onto between the time customers pay premiums and the time they make claims on their policies. Insurance companies invest float into income-producing assets such as bonds and stocks to generate additional profits. At the end of 2017, Aflac's float was invested in $110.5 billion worth of assets. The vast majority of Aflac's investments are in low-risk fixed income securities, specifically high grade corporate and Japanese government bonds. The company's yield on these investments has struggled in recent years thanks to record low interest rates around the world, but especially in its key market of Japan. In fact, Aflac's new money yield in Japan averaged below 2% in 2016 and 2017, compared to an average yield around 4% in the U.S. However, those rates have finally started to rise, thanks to strengthening economic growth in both the U.S. and Japan. This allowed Aflac to generate $3.2 billion in investment gains in 2017, representing 15% of its total revenue. Aflac's long-term success, including 35 consecutive years of rising dividends (the company is a dividend aristocrat), is largely due to several enduring competitive advantages that the firm enjoys. The insurance industry itself is notoriously competitive, thanks to a highly fragmented market and policy commoditization. In other words, there are lots of insurance companies out there trying to sell essentially identical products. As a result, many insurers end up competing on price, and some will underprice risk and generate combined ratios over 100%. This means that these insurance companies are accepting losses on their policies in order to undercut their rivals. Only making strong investment returns on float can allow such companies to survive in the long term. However, they usually have to take relatively dangerous risks with their investment portfolios in order to achieve investment gains to more than offset their policy losses, such as by investing a relatively high amount of their float in stocks. Aflac is able to avoid this risky behavior thanks to three key competitive advantages. First, the company has been around for a long time, 63 years in the U.S. and 43 years in Japan. In addition, the company's brand, made famous by the Aflac duck ad campaigns in the early 2000's, has resulted in about 9 out of 10 people in Japan and the U.S. recognizing Aflac’s brand, per management. Aflac has also spent decades building up an extensive network of affiliates and sales agents, including 109,000 in Japan alone. This is a key reason why Aflac commands the top market share in its industry in the U.S. and Japan. In fact, in Japan, where supplementary insurance is extremely popular, Aflac insures one in four households. The combination of a trusted brand and an extensive sales agent network also helps Aflac offer comprehensive policies at lower rates than most of its rivals. All while still turning industry leading profits on those policies. As a result, Aflac can afford to invest its float in much lower risk assets, which avoid blowing up its balance sheet and causing huge losses during turbulent market conditions. Simply put, it would take new competitors many years and cost a fortune to replicate Aflac’s distribution network, brand strength, and scale. Aflac's long history provides another competitive advantage in that the company has managed to achieve some of the industry's best actuarial data. In other words, Aflac's records give it a very comprehensive statistical database that allows it to predict with high accuracy how much risk each policy represents. This in turn allows the company to be more competitive on price, while simultaneously minimizing the risk of losing money on a policy. The end result is a highly disciplined corporate culture, led by Chairman and CEO Daniel Amos. Amos has been with the company for 45 years and is steeped in Aflac's traditions of disciplined underwriting and conservative investments. Going forward, Aflac intends to increase its investments in technology to further exploit its competitive advantages. According to CFO Fred Crawford, the company will invest $250 million over the next three to five years to "drive greater penetration and greater growth." In 2017, Aflac saw its operating earnings per share rise about 5%, and management thinks that it can achieve about 12% growth in 2018, thanks in large part to tax reform. Over the long term, analysts believe Aflac is capable of generating about 8% annual EPS growth. That solid growth rate will be helped by the company's aggressive buyback program which has reduced Aflac's shares outstanding by 4.1% per year over the past five years. If the company achieves these growth targets, then it would likely be able to grow dividends at a similar mid-single-digit pace, making the stock a potentially attractive long-term income growth investment. However, there are several challenges that could cause Aflac's long-term growth to disappoint. While Aflac has always prided itself on a disciplined approach to conservative business practices, the company has been facing a scandal that threatens to tarnish its clean corporate image. The online newspaper The Intercept published an article in January 2018 (the first in a series) outlining claims of fraud and abuse by Aflac against its workers. The accusations include exploiting sales associates, misleading investors, and manipulating its accounting. Management put together a special committee that concluded the allegations were mostly false and without merit. However, ultimately investors will want to consider whether they wish to risk further allegations coming to light which could embroil Aflac in a potentially Wells Fargo-like series of scandals. Even if these allegations do indeed prove groundless and the scandal blows over relatively quickly there, are still three key risks facing the company. First, Aflac has a large dependence on the Japanese market, which means that the company's reported results are sensitive to foreign currency exchange rate trends. Approximately 76% of Aflac's revenue is denominated in Yen, which has been weakening against the dollar in recent years. The Yen is weakening largely because the Bank of Japan has been aggressively printing money to buy government bonds and ETFs. Japan's monetary policy is meant to drive down borrowing costs and increase share prices to allow companies (and the deeply indebted government) to borrow very cheaply as well as use equity as a cheap source of growth capital. currency effects have historically been between 0.6% and 4.5%. Or to put another way if the Yen were to weaken substantially, most if not all of the company's earnings growth could be offset by currency fluctuations. Another risk to consider is that Aflac has recently benefited from stronger growth in Japan and the U.S., causing interest rates on its float to rise (more interest income on its portfolio). However, with both countries now in the later stages of their economic cycles, this development could soon reverse. During a recession, interest rates are likely to fall substantially, reducing the profitability of Aflac's float. Finally, while Aflac has built its fortune and impressive dividend growth record on success in Japan, this may become harder to do in the future for two reasons. 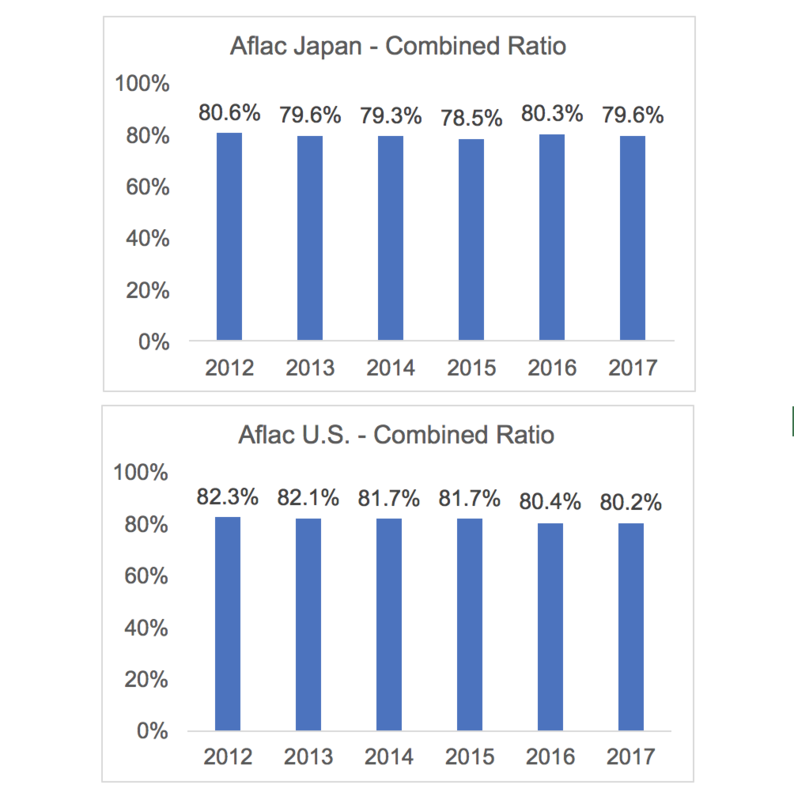 First, Aflac already insures 25% of Japanese households, meaning that it could be approaching the limits of its market share, at least without resorting to far less stringent underwriting standards. The second reason is that Japan is facing what some economists are calling a "demographic time bomb." Of Japan's 127 million people, nearly 30% are over the age of 65 (the single largest demographic in the country). This has actually helped Aflac in the past, because insuring against old age and various other economic surprises has made Japan's supplemental insurance market incredibly popular and lucrative. However, in 2017 Japan's fertility rate hit its lowest level in more than 115 years, and last year the country's deaths outnumbered births by 400,000. All told, demographers are predicting that by 2100 Japan's population is likely to shrink by as much as 34%, making it the fastest shrinking large country on earth. As a result, Aflac's Japanese business, while a cash cow today, faces potentially sizable long-term growth hurdles. No matter how large its market share may get, in the end the total market size is driven by population growth, which is expected to decline at an accelerating rate. Aflac has proven itself to be one of the best-run and most shareholder-friendly companies for decades. A skilled and disciplined corporate culture steeped in conservative insurance underwriting has resulted in some of the industry's best profitability, which seems likely to persist given Aflac's scale, channel networks, and brand recognition. As a result, the company should continue to be a source of safe and growing dividends for years to come. 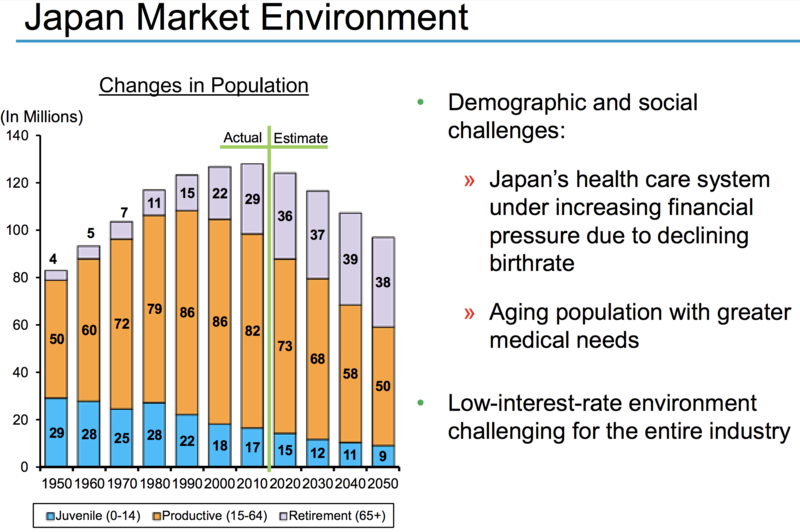 Just be aware that management will eventually have to find a replacement source of growth once Japan's challenging demographics start to overwhelm its Japanese segment's ability to grow.